Artist and Musician of some renown/infamy. I've been following you since the dial up days. 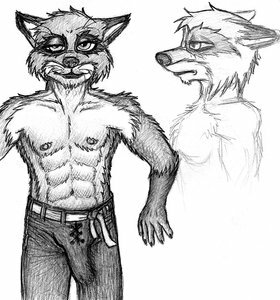 Back in the dawn of the furry art age. You might have even been the very first cub artist I learned the name of. I bet most of these kids have never even heard of furnation. Oh the good old days. Thank you for keeping it up and not dying. I just realized that the amount of time that I've know about your art isn't measured in years, it's measured in decades. 2 decades to be precise. I um got introduced to some harder stuff and you got some goodies ^.^ and I would love to have a piece from you involving such gory things some time. and if you ever decide to take commissions, I would love to get a picture/comic.